The stage is set for an intense title showdown in Newcastle after Jamie Whincup led home arch rival Scott McLaughlin in the second leg of the ITM Auckland SuperSprint. 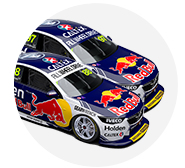 After a race-long battle between the pair, the Red Bull Holden lead the Shell Ford home by 5.9 seconds, securing Whincup the Jason Richards Trophy for the most points over the weekend. 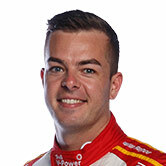 Fifth place leaves Fabian Coulthard 176 behind, while difficult days for Chaz Mostert and Shane van Gisbergen have all but ruled them out, both more than 260 adrift. “We needed that. 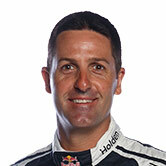 Just trying to give ourselves an opportunity at this one,” said Whincup of the championship. “My mate beside (McLaughlin) is pretty quick, the guys have been digging deep to get the best out of our car. Added McLaughlin: “I’m pretty gutted, sorry to the fans we couldn’t get it done. We had to save a lot of fuel at the end, I was on fumes. Whincup had made the most of his pole position to lead into the first corner, McLaughlin only narrowly holding off Mostert at Turn 1 to remain second. Disaster struck for Mostert later in the lap as an attempted pass from Cam Waters on Mark Winterbottom forced The Bottle-O entry into its Supercheap stable-mate. Mostert spun to the back of the field, while Winterbottom was amongst others to suffer a delay, dropping outside the top 20. From there it was all about the top two, with McLaughlin shadowing Whincup until lap nine when, 1.7s adrift, he attempted an undercut by pitting. Whincup covered by stopping a lap later and, retaining the lead, continued to show the way until the Red Bull team triggered the second stops on lap 36. McLaughlin this time pitted a lap later and, having been 1.6s adrift before the stops, rejoined temporarily in front, only for the Holden to sweep around the outside at Turn 1. 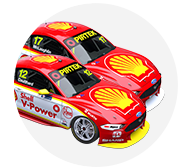 The Shell Ford continued to stalk Whincup until the leader begin the ease away in the closing stages – the margin blowing out by more than three seconds in the last five laps as McLaughlin was forced to save fuel. Waters escaped damage in his early hit on Winterbottom to finish third, his first podium in a single-driver Supercars event, but the incident will be investigated post-race. Craig Lowndes charged from 12th on the grid to secure a fine fourth ahead of Coulthard, Garth Tander, Jason Bright and a recovering Mostert. Saturday winner van Gisbergen’s championship charge fell apart in bizarre circumstances, nailing the back of Tim Slade’s Holden at pit entry on lap 16. The Red Bull team repaired extensive front-end damage to ensure the Kiwi returned to score some points in 24th. Yesterday’s second-placed finisher Winterbottom was just five places further ahead having served a drive-through for speeding in pitlane while trying to recover from his opening lap incident. James Courtney and Lee Holdsworth were the only retirements, with both Holdens having taken front-end damage in a concertina triggered by the three-car Prodrive incident. Clouds threatened the venue throughout the race, but did not deliver any drops of rain until moments after the chequered flag.